Super Extreme Dietary Supplement Accelerator Pills main function is to lose weight and keep body shape by reducing appetite. 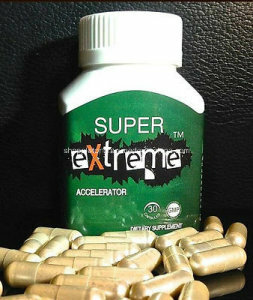 Super Extreme is 100% original without any side effect . 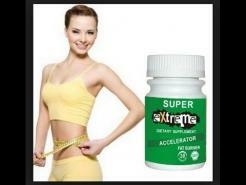 .New upgraded formula that contains the best formula of all weight loss pills. .Bottle is square, different as round bottles as usual. .Helps to burn off excess body fat effectively in areas such as arms, stomach, legs and waist. .Works fast! with just 1 pill per day, you can lose anywhere from 2-5 lbs. per week. .Natural extracts known to help increase fat loss and help you lose weight. .Will not make you feel jittery or speedy, no unwanted side effects. Take one (1) capsule daily, before or after your first meal of day. Drink 8 glasses of water per day. Slimming, Regulate blood fat, weight loss. Not applicable for women in pregnancy, breast feeding and patients of cardiovascular disease and apoplexy.